Gallery visits that we made on our recent trip around Australia began and ended with shows from Tjala Arts in Amata, SA. We opened with Anangu Maruku Mulapa (This is our real way) at Alcaston Gallery in Melbourne and spent the Sunday before our departure from Darwin with Matt Ward at Outstation Gallery while having a relaxed opportunity to review, one last time, Nganampa Kampatjanka Uungutja (Behind our canvas). I’ve said in earlier posts that among all the work we saw from the APY Lands, Tjala Arts appeared to me to be leading the pack both in terms of quality and in surprising innovations in form and color. With Outstation basing its reputation and its exhibition program around emerging artists, to discover new experiments in that show was perhaps unsurprising. However, the Alcaston exhibition also offered a generous share of newer artists and styles that might not be immediately recognizable as descendants of the pioneering essays in form and color from Tjungu Palya, which has obviously clearly influenced recent developments at Tjala. But rather than focus on paintings in this post, I want to hand the podium over to Tjala Arts. The small, beautiful catalog that Outstation prepared for their exhibition contains an introductory essay by Frank Young, Director of Tjala Arts and the chairperson of Amata Community. Almost as soon as I finished reading it, I thought it would be a shame if its circulation were limited to those fortunate enough to have visited the exhibition and received a copy of the catalog. So I wrote to Tjala Arts asking them for permission to reproduce Mr. Young’s words here, and I was delighted when they quickly agreed. And so, without further commentary, here it is. Anangu tjutangku paintamilara tjana tjunanyi Tjukurpa irititja tjanampa ngura nguru. Tjukurpa Anangu tjutangku wangkanyi canvas-tjanka Tjukurpa mulapa. Palu Tkukurpa kutjupa tjuta tjana wangkanytja wiya. Pala paluru Tjukurpa kumpilpa canvas-tjanka unngutja. Tjana wangkanytja wiya panya Tjukurpa milmilpa. Tjana kanyilpa tjanampa Anangu tjutaku. Nyanga Tjukurpa kumpilpa tjuta tjanampa iritija tjuta nguru. Anangu tjuta para ngarapayi ngura kapi piti munu kapi piti kutjupa kutu kulu, munu Tjukurpa kumpilpa nguru Tjukurpa kumpilpa kutjupa kutu kulu. Tjukurpa kumpilpa tjuta putu Anangu tjutangku tjakultjunanyi canvas-tjangka munu putu tjakultjunanyi panya Tjukurpa pulka mulapa ngaranyi kumpilpa Tjukurpa unngutja Anangu tjutaku. When Anangu people paint, they are putting down old stories from their country. The Tjukurpa (Dreaming/Law) that Anangu tell on the canvas is their real story. But part of that story they do not tell. That is the story hidden deep inside the canvas. They don’t reveal it because it is sacred Tjukurpa. They keep it for their own people. These sacred stories come from ancestors, when people travelled from rock-hole to rock-hole, sacred site to sacred site. There are secrets that people can’t talk about in their canvas because big Tjukurpa is really deeply inside Anangu, it is Anangu. I was born near Watarru in the far west of the APY lands near the Western Australian border, at a place called Atuti. I grew up in that area, in my mother’s country and my grandfather’s country. My grandfather’s name is Mintjil and he is a Watarru man. He was born there, as was his daughter, my mother. She was born there too. I’ve worked in many places and on many jobs in the APY Lands. When I was young I did fencing, but I’ve been a motor-car mechanic, aeroplane mechanic, Aboriginal Health Worker, and worked for APY Land Management for nearly twenty years until I retired from that job. I also ran my own community for over 12 years. Now I am working and helping the Art Centre at Amata, Tjala Arts. I work with the artists and the Art Centre managers. I talk to them, interpret stories and talk to the media, like SBS, ABC and newspapers, particularly when journalists want to come in and talk about art work. I am doing all that now, talking to journalists about art work and what people do in Art Centres. Artists in remote communities travel around country and go into caves and see the artwork of their ancestors. They see what their ancestors did a long time ago and it comes out in the their own canvases. This is what you see in the paintings that the artists are making in Art Centres. The is the secret to their stories. They bring out the story of their ancestors from what they have seen in rock paintings. I think that people don’t understand that this is what is good about art centres in communities. Our stories are strongest when we paint in our country. The studios in town no not get to do this. The white-fellers running shops in town don’t get to see this because in those places, the artists don’t put this on the canvas. We do sometimes go to exhibitions in towns and cities and tell the stories of the artworks. What is important for us is not the picture, but the story. We can speak about the stories that are on the surface of the artworks but inside, really at the bottom of that art is the story from the ancestors. This is the story that is hidden away–kept safe because it is sacred to Anangu. And that is the same way for all Anangu artists. People sometimes say Anagu in communities are working for white fellers and not running their own Art Centres. I think people think Anangu are not capable of running their own businesses. This is not true. Anangu are smart business people too. At Tjala Arts, it is true that Anangu are running their own show. We have workers– like Skye and Jo–and they do their work, but Anangu make the decisions and say how the business should be run. We are the best ones to know how the business should be run in our own community. People from outside the APY Lands sometimes do not understand this but Art Centres are controlled by the Anangu members and the Directors of the Art Centre. That is the point I’d like to make. It is important that Anangu run their own business and know it’s their right. They have to be strong in running their own business in their own Art Centres. In some places off the APY Lands, the companies are not Aboriginal owned and Anangu have no say. Community Art Centres are run by Anangu and community Art Centres belong to Anangu. This is the most important thing, for Anangu to hold something for themselves. Another important thing about Anangu Art Centres is that they are a good way of old people giving knowledge to young people. When an Anangu artist creates a painting, they are remembering what the ancestors did and what the ancestors taught them. Bringing the stories up to the surface and making them alive in people’s minds, means they are easy to pass on to the young ones. This is a very important thing. When old people pass away–and they will go soon–the young people have to have the stories behind them. I think everyone knows that this is important, for Aboriginal people to hold on to their culture. The place where this can happen is in the communities where we live, supported by the Art Centres that we own, with our country and people all around us. Frank Young, as told to John Tungku Tregenza, ©2011. One of the reasons this essay resonated with me so deeply, apart from what seems to me the essential righteousness of every word in it, is that it brought me back powerfully to 2007 and the days that surrounded my own visit to Amata and Tjala Arts. In some ways those fantastic days I spent touring through two dozen communities were bracketed by hope and despair. The hope arose from the recently completed Senate Inquiry into Australia’s Indigenous Visual Arts and Craft Sector, during which witnesses and submissions argued again and again for the importance of Aboriginal controlled art centres in the communities. The veil of despair began to descend just days after my return to the United States with the announcement of the Northern Territory Emergency Response, which not only overwhelmed any chance of the Senate Inquiry’s recommendations being taken up and acted upon, but made it clear that Aboriginal control of their communities, even the false promises of self-determination policies, was gravely endangered. Mr Young’s essay both endorses the hope and renounces the despair. There’s one more personal note to sound in conjunction with the Nganampa Kamatjanka Uungutja at Outstation Gallery. Our first visit to see the show coincided with the arrival at the gallery of the Tjala crew prior to the official opening. The best memory that I have of the few hours spent in Amata in 2007 was the chance to relax for a few moments in the men’s painting shed with Hector Burton and the chance, with John Oster’s assistance, to hear him talk about his life. Although I’m sure Mr. Burton didn’t remember my visit, he was gracious enough to allow me to take his portrait beside his new painting, Anumara Tjukurpa (Caterpillar Dreaming). 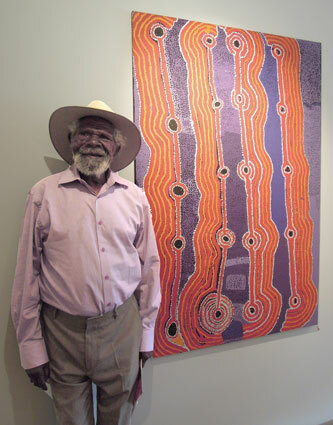 He told me something of the story behind it, as Frank Young suggests that the artists will do: that this painting is different from many other anumara tjukurpa that he has made lately, as it comes from his grandfather’s side of the story, from over the border in Western Australia. As the senior man who encouraged the transition at Amata from a women’s (minymaku) art centre to one that supported men’s painting, and as the architect of a new program begun in 2010 to bring young people into Tjala Arts to paint, Mr. Burton seems to me to be a most appropriate emblem of Mr. Young’s thesis, with which I can conclude this essay of my own. This entry was posted in Art, Communities, In Australia and tagged Exhibitions, Tjala Arts. Bookmark the permalink.